This entry was posted in Uncategorized and tagged naturopath uxbridge on April 21, 2018 by dk. The body is miraculous!! For all the body’s pa rts and abilities, there are corresponding systems designed to monitor what is being experienced and deciding whether what the body is experienced is beneficial or detrimental. All this so that we can function well overall. These systems – circulatory, digestive, endocrine, immune, integumentary (hair, skin, nails), lymphatic, muscular, nervous, reproductive, respiratory, skeletal, and urinary are referenced frequently by all of us. When someone asks how we are feeling, we usually point to something, a symptom, that’s affecting one or more of these systems since they so readily help us check in on our bodies, giving us a sense of how well we are (or are not) at any given time. When we’re unwell, understanding systemic symptoms can help us to determine where to look for the underlying issues. Sometimes we talk about our skin breaking out, hair thinning or falling out, or nail splitting. Or, we might complain of feeling sluggish, heavy, uncomfortable, or constipated. Signs like these show us there is something deeper going on in the body. It becomes important to then explore these signs more deeply, to look to the organs that support our systems and keep them functioning effectively, and to take care of them when they’re showing us signs that all is not well. The organs help the body maintain overall health, and of course organs like the heart, brain, and lungs are responsible for some of the most fundamental functions of life. Without them, we wouldn’t be here! Part of maintaining overall health involves functions that include neutralizing and eliminating toxins and irritants. The organs that help most with these functions are the lungs, the skin, the digestive tract, and most importantly: the liver and the kidneys. When you start tracing back the symptoms of sickness to the organs that help keep the body functioning optimally, you can start to see the connections to possible underlying weaknesses and issues. How Does the Body Cope When Faced with Toxins and Irritants? The simple answer? Detoxification. One of the things the body is especially good at is sweeping out any toxic elements and chemicals that can compromise overall health. That’s a big part of what our organs are designed to do – and most of the time they do it extremely well! However, not all toxins are equal and there are many factors that can affect how the body responds to them at any given time. Also, toxins come from many different sources. In fact, the definition of a ‘toxin’ is surprisingly simple and broad: anything that the body doesn’t find useful or that harms its integrity is toxic to the body. The fact is, we’re working to clear toxins all the time both internally and externally. The most common toxins we regularly encounter come from: poor diets and poor digestion causing undigested food that ferments in the digestive tract and creating an acidic environment in the body. Other sources such as drugs, alcohol, tobacco, the plastic that we wrap our food in or drink our water. Environmental toxins like air and water pollution, smoke, pesticides, animal and insect bites. Electromagnetic pollution from appliances and tools such as microwaves, cell phones, computers, wireless internet, and TVs. The list is very long. Even negative thoughts and emotions, if they persist long enough, have been shown to be toxic to our bodies because they turn into significant sources of stress – the number one root cause of illness. This toxic burden is an inescapable part of modern life. When subjected to all of these forms of toxins at once – as most of us are – it’s easy to see how our bodies can become inundated with chemicals from which we need to either protect ourselves or clear out of the body. It’s also easy to understand why, even though we might be doing everything we can to sustain a healthy lifestyle and keep our toxin-fighting organs in prime condition, our bodies sometime need help. As I said before: the body is constantly detoxifying. Day in, day out, all day (and night) long! Our organs are designed to do just that to keep us healthy. But, we all experience toxic overload at one time or another. Who hasn’t been super stressed out and fell to poor dietary habits or more frequent glasses of wine? Who hasn’t experienced an illness that compromised their health to the point where they just don’t seem to get better? These are just some instances when toxic overload makes our organs’ job of clearing toxins more difficult. 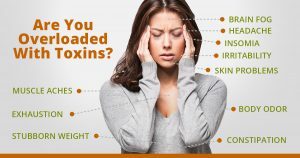 Sometimes toxins that we experience daily become a combined, overwhelming force while at other times we experience a mix of toxins in particularly high doses all at the same time. Ongoing situations like this can lead to chronic toxin overexposure. Learning to identify and properly respond to toxin overload can make a huge difference in our ability to heal from it. When you’re experiencing symptoms like these, it’s the right time to visit me. I would like to help you reactivate your body’s natural defense mechanisms so that you can experience optimal health every day. Sometimes, our organs need extra help in their work eliminating toxins. We have lots of ways to help you ensure that toxins are kept at bay, and that your organs are happy, healthy, and strong. Call me at 905-852-7969 or email me at [email protected] and I’d be happy to have a detailed consultation with you to find the right pathway to your optimal health.